Bring the Kids for some pre-show fun! 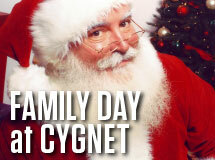 Cygnet Theatre invites you to Family Day. Enjoy holiday coloring station, hot chocolate and a visit from Santa! Kids 12 and under are half price with paid adult. Have fun and socialize at special evenings for theatre lovers from the LGBT community featuring a pre-show mixer on Cygnet's Elaine Lipinsky Patio featuring Happy Hour prices on all of our drinks. Everyone is welcome. A theatre ticket for the evening's performance is required to attend. Join Cygnet for an evening combining craft local beers and engaging local theatre. Beer tastings begin at 7:00pm on select dates, followed by a 8:00pm performance. A theatre ticket for the evening's performance is required to attend. 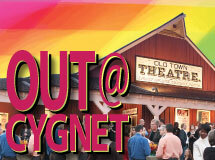 Join Cygnet for elegant evenings combining fine local wines and engaging local theatre. The wine tasting begins at 6:30pm on select dates, followed by a 7:30pm performance. A theatre ticket for the evening's performance is required to attend.